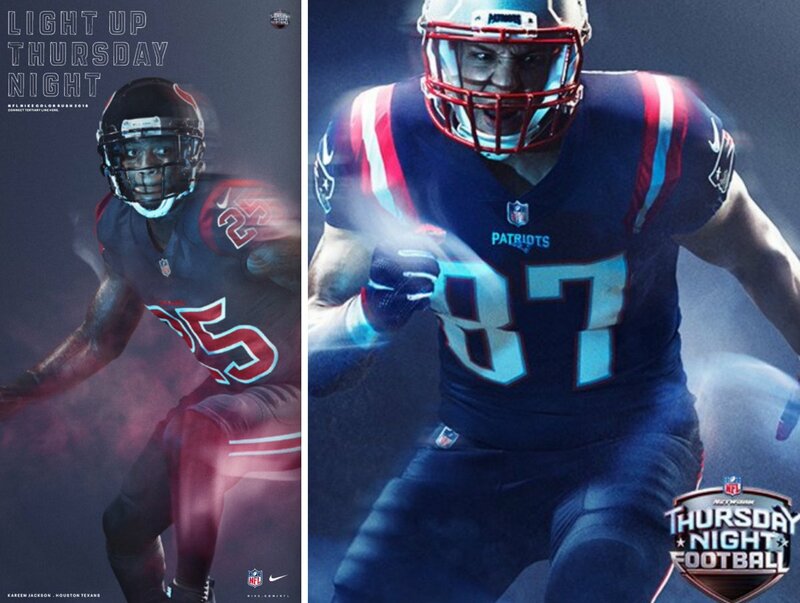 After an eight-team experiment last season, the NFL and Nike have doubled down on their Color Rush uniforms -- the monochromatic designs worn for Thursday night games. The league and its uniform outfitter unveiled new Color Rush for all 32 teams Tuesday. How did they do this time around? Let's take a game-by-game look at what you'll be seeing on Thursday nights: Sept. 15, Jets at Bills: The Bills and Jets played the first Color Rush game of 2015 (a game that reportedly caused major problems for fans with red-green colorblindness), so it's fitting that they're also in the lead-off spot this season. The Bills' uniform is the same red design they wore for that 2015 game, and they've avoided the colorblindness issue by dressing the Jets in white -- a look that's extremely similar to their standard white uniform. On the scale of "Wow!" to "Ewww," with a few grades in between, this one clocks in as a solid meh. Sept. 22, Texans at Patriots: The promotional photos for this game initially showed the Texans in navy and the Pats in blue, which didn't make sense -- it would be a visual fiasco (and would likely set a record for interceptions, as quarterbacks kept throwing to players on the wrong team). It now turns out that the Texans will be wearing white, which seems like an uninspired choice. Wouldn't solid-red have been better? Grade: Meh. Sept. 29, Dolphins at Bengals: We've seen the Dolphins in solid aqua, so it's good to see them going with orange instead. And white actually makes sense for the Bengals, because the white Bengal tiger is a real animal. Grade: Not bad! Oct. 6, Cardinals at 49ers: Not a lot to get excited about here, as the Niners will be wearing the solid-black alternate uniform they wore last season, and the Cards will be wearing a white design very similar to their standard white uni. Wasn't this uniform program supposed to be innovative? Grade: Meh, verging on ewww. Oct. 13, Broncos at Chargers: Now here's how it's done. Both uniforms look great, the color pairing of orange versus blue looks even better, and the Broncos are even spicing things up by using their old throwback "D" helmet logo and retro striping tape. 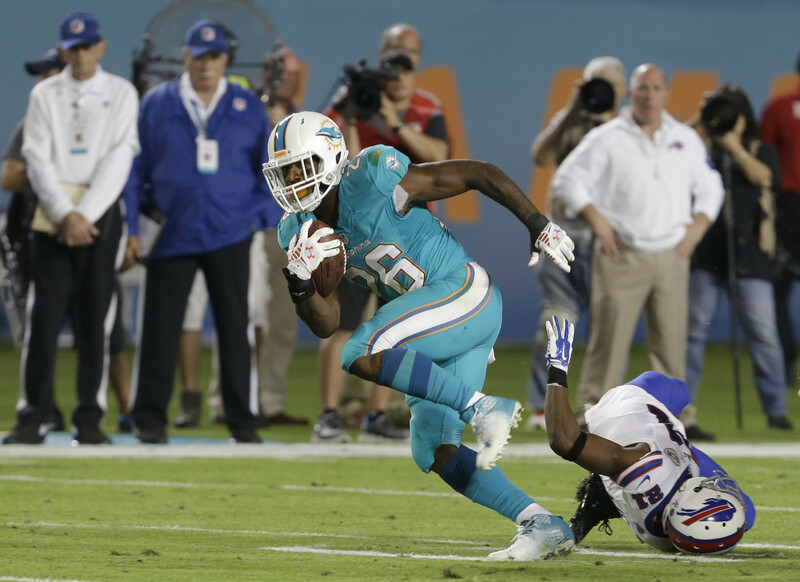 (The blue helmet shell will remain the same and will thus not violate the league's one-shell rule, which is designed to minimize the risk of concussions.) Further info here. Grade: Wow! Oct. 20, Bears at Packers: This one feels like a major missed opportunity. They could have gone retro and put the Packers in green (there's historical precedent for it) and had the Bears wear white Gayle Sayers-era throwbacks. Instead they have the Bears wearing navy (yawn), and there's something about the Packers' white pants that makes the whole affair feel like a scrimmage. Grade: Snooze-o-rama. Oct. 27, Jaguars at Titans: These two teams faced off in a Thursday-night game last year, and the solid-color uniforms they wore for that matchup are being dusted off and worn again. It didn't look too good the first time around and it's unlikely to look any better in 2016, so this might be a good night to make other plans, like working on your Halloween costume (which couldn't possibly look worse than these uniforms). Grade: Ewww. Nov. 3, Falcons at Buccaneers: Let's be frank: There's probably no way to make a Falcons-Bucs game look good, at least under their current uniform programs, so you might say this uniform pairing has reached its, uh, full potential. Also: If they whole point of the Color Rush system is to have solid-color uniforms, why not remove those clown stripes from the Falcons' sleeves? A clean white look, without any of the trim, would be a major improvement. Grade: Ewww. Nov. 10, Browns at Ravens: As longtime readers are aware, your friendly uniform columnist harbors a strongly held aversion to purple. But you know what? That Ravens uni doesn't look so bad. The gold numerals really pop against the solid-purple background, and the black helmet feels like just the right accent. As for the Browns, let's hope the pants don't have those big, honking letters down the side. Grade: Could be worse. Nov. 17, Saints at Panthers: If the Panthers uni looks familiar, it's because they wore it for a Color Rush game last year against the Cowboys. Not a great look, but it'll be worth tuning in for this game anyway, because that Saints uni is a keeper. Like, can they just wear this for all their road games? Or maybe all their home games? So simple, so nice. Grade: A mixed bag. 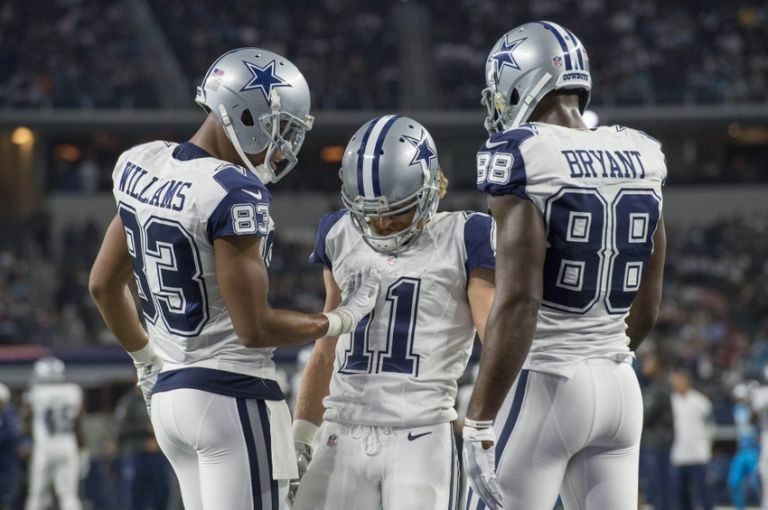 Dec. 1, Cowboys at Vikings: The Cowboys design is the same one they wore last year on Thanksgiving. Looked pretty good then, still looks pretty good now. As for the Vikings, there are only so many solid-purple uniforms that a purple-averse uniform columnist can stomach. Grade: A mixed bag. Dec. 8, Raiders at Chiefs: This won't be a bad-looking game -- both uniforms are OK. But when Oakland and Kansas City face each other while wearing their normal uniforms, it's always one of the best-looking games of the year (or, rather, two of the best-looking games, because they're in the same division). Why would you mess with that? And if you had to mess with it, wouldn't it be better to the Raiders live up to their renegade image by wearing solid black? Grade: Could be worse, but could also be so, so much better. Dec. 15, Rams at Seahawks: The Seahawks were made for Color Rush, and their green superhero costume is the fullest expression of this program's values: loud, brash, slick, youth-oriented. Lots of people will love it and lots of others will hate it, and that's precisely the idea. It's tough to say how it'll look to have 11 players wearing it (especially on a green field), but it's definitely worth tuning in to find out. Oh, and the Rams are also playing. Grade: Color me intrigued. Dec. 22, Giants at Eagles: Cool move by the Giants, who are swapping out their usual "ny" helmet logo for their old "Giants" logo -- a good way to change things up. Unfortunately, the Eagles are going with the same solid-black look they've used as as an alternate uni in recent seasons. That green collar on the black jersey is just the worst, no? Why not go with solid midnight green? Sigh. Grade: A mixed bag. Dec. 25, Ravens at Steelers: This game isn't taking place on a Thursday, but Steelers president Art Rooney II wanted to the team to have a special look for Christmas Day, so Nike obliged with a solid-black design. Old-schoolers won't like it, but come on -- that's a great-looking uniform. Word through the grapevine is that the Ravens will likely wear white, although it's not yet clear whether they'll just wear their usual white design or new Color Rush whites. Either way, expect Pittsburgh to be the visual star of this show. Grade: Wow! And there you have it -- a mix of good, bad, and a lot in between. When you step back and look at the entire program as a whole, it's easy to see that the real problem with Color Rush is the same this year as it was last year: It feels more like a corporate marketing program than an on-field design program. As a result, too many of the designs feel forced, and too many of the game-specific color pairings don't work. Also, the designers are somewhat hamstrung by the NFL's regulations limiting teams to one helmet shell color (although that might be for the best, given some of the "creative" helmets we've seen in college football), which in many cases keeps these uniforms from being truly monochromatic from head to toe. Wouldn't it be better if, say, the Titans could have a blue helmet to go with their solid-blue uniform? Or if the teams wearing white could have white helmets? It might work, or it might not, but it's unfortunate that they can't even try. Three other points worth mentioning: First, the Color Rush uniforms will all be executed in Nike's Vapor Untouchable tailoring template, which is supposedly more advanced that the Elite 51 system that's used for the NFL's other uniforms. This will mark the first time that a particular uniform technology system has been designated for a particular slate of NFL games. It remains to be seen if all NFL uniforms will be converted to the Vapor Untouchable system next season. Second, you may have noticed that three teams weren't invited to the Color Rush party this year: the Colts, Lions, and Washington. That's because they're playing on Thanksgiving, which isn't part of the Color Rush program this season. But new uniforms were still designed for them, and they're being sold at retail along with the rest of the Color Rush merchandise line. Speaking of which, all of the NFL's proceeds from the sale of Color Rush jerseys will go directly to the NFL Foundation to fund health, safety, and wellness programs for American youth, with the first $500,000 earmarked to replace youth and high school football equipment and fields lost during last month's flooding in Louisiana. Paul Lukas will probably have a heart attack if another pro league unveils dozens of uniforms all at once on the same day. If you liked this column, you'll probably like his Uni Watch Blog, plus you can follow him on Twitter and Facebook. 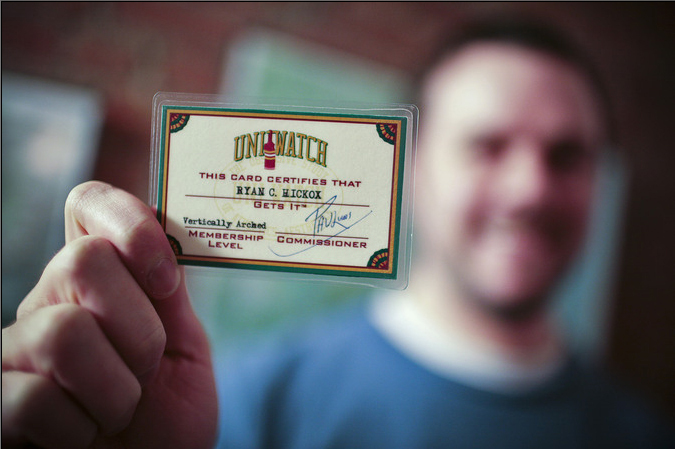 Want to learn about his Uni Watch Membership Program, be added to his mailing list so you'll always know when a new column has been posted or just ask him a question? Contact him here.